Brazil is not very happy about all these NSA revelations. As home to Latin America's biggest economy, the country understandably hates the idea that the United States is listening to its phone calls and reading its emails. In fact, Brazil hates it so much that it wants to disconnect itself from the U.S. internet altogether. Force Internet companies like Google and Facebook to build servers inside Brazil's borders so that they would be subject to Brazilian privacy laws. Build more internet exchange points in order to route Brazilian traffic around potential spyware. Launch a state-run email service through the postal service to act as an alternative to Gmail, Yahoo Mail and others. Rousseff has also demanded a detailed report of the extent of American intelligence gathering in Brazil. While the move to create an independent internet seems extreme, the idea of pushing U.S. authorities for more transparency is at the very least understandable. In July The Guardian's Glenn Greenwald reported that Brazil is second only to the United States when it comes to the amount of communications subject to NSA surveillance. We don't know specific numbers, but we do know that U.S. spies are watching Brazil, an ally, as closely if not more closely than countries like China and Iran. Why? Well, as former director of both the CIA and NSA, General Michael Hayden, explained to The New Yorker recently, "That's where the transatlantic cables come ashore." It's true. 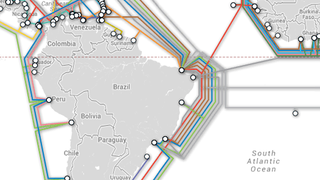 If you look at a map of the undersea cables, you can clearly see how Brazil is one of the most important telecommunications hubs in the world. This fact also further complicates Brazil's plan to disconnect itself from the U.S. internet, a move that lawmakers aren't even sure is possible. Update: In a culmination of disapproval over America's spying on her people, Rousseff canceled a planned trip to Washington on Tuesday. Obama tried to talk her out of cancelling on Monday night. He also failed to make a public apology for the spying like she'd asked.